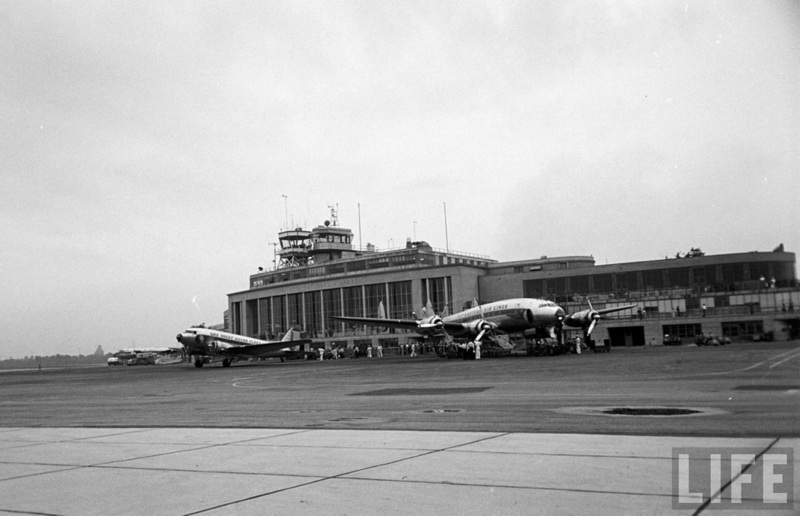 Below: DC-3s of "The Great Silver Fleet" lined up at the far east end of Atlanta's Temporary Terminal. The aircraft at far right is heading for the taxiway. Eastern DC-3 taxiing to the runway on the north end of Atlanta airport. Virginia Avenue is in the background and the area at right is now the site of Delta World Headquarters. 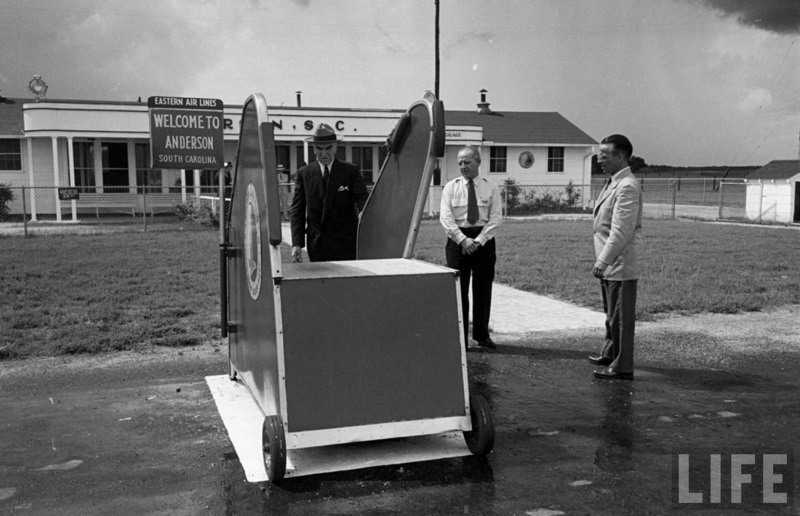 One of the smallest stations on Eastern's system was Anderson, SC, an intermediate stop between Atlanta and Charlotte served by two daily flights, one in each direction. On this particular day, the LIFE photographer was joined by none other than World War I ace and head of Eastern Air Lines, Eddie Rickenbacker (at left in black) who was renowned for flying the system and showing up unexpectedly. 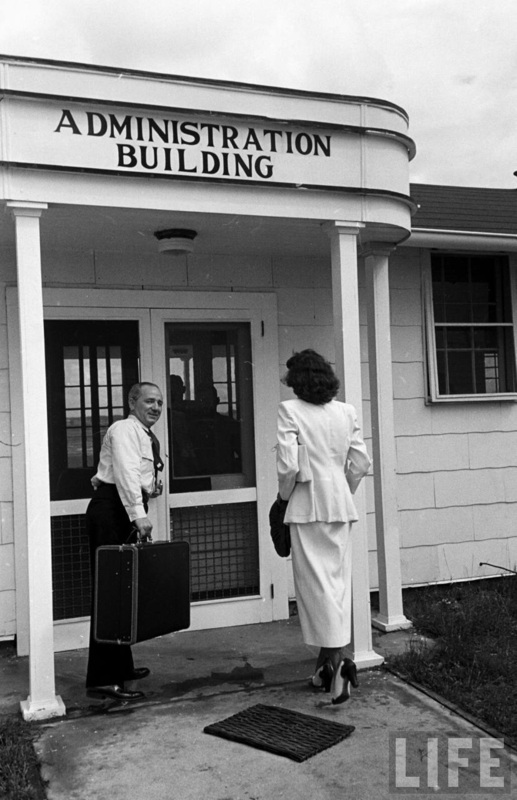 LIFE wrote, "He runs the airline from a briefcase as he rides endlessly and unheralded over his 85-city route like a hawk-nosed circuit court judge dispensing advice in picturesque language." The employees knew he might show up at any time and worked accordingly. 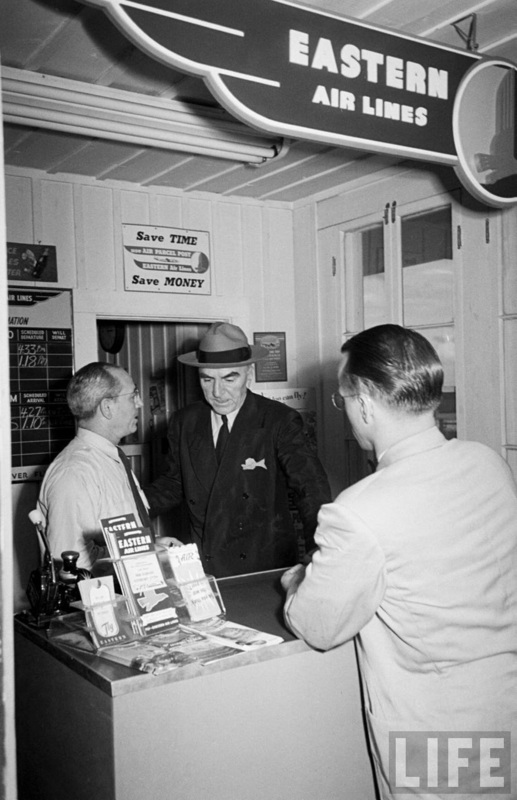 "Captain Eddie" converses with the station manager behind the ticket counter at Anderson, SC. 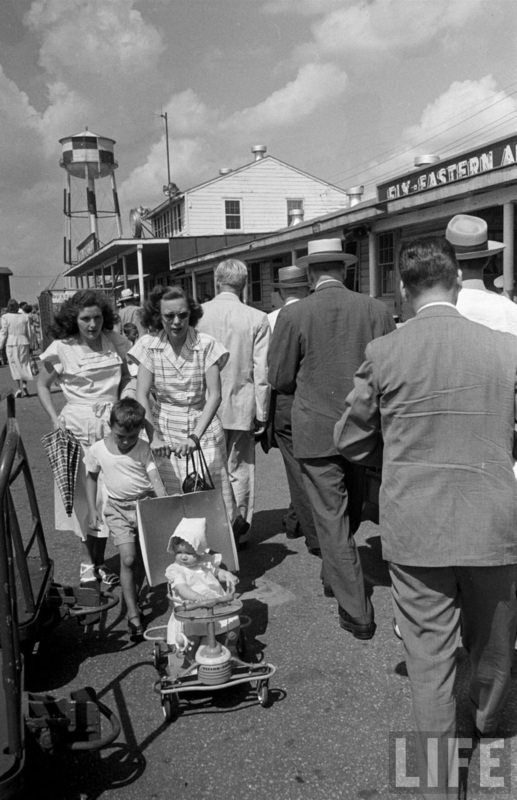 Notice the arrival and departure times on the board at far left. 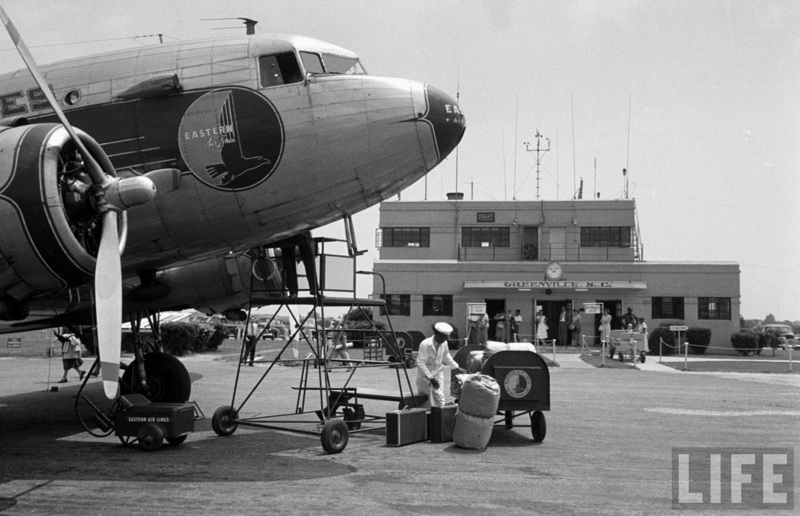 DC-3s spent as little as 6 minutes at the gate before departing. The station manager, apparently a true Southern gentleman, carrying luggage and opening the door for a female passenger. 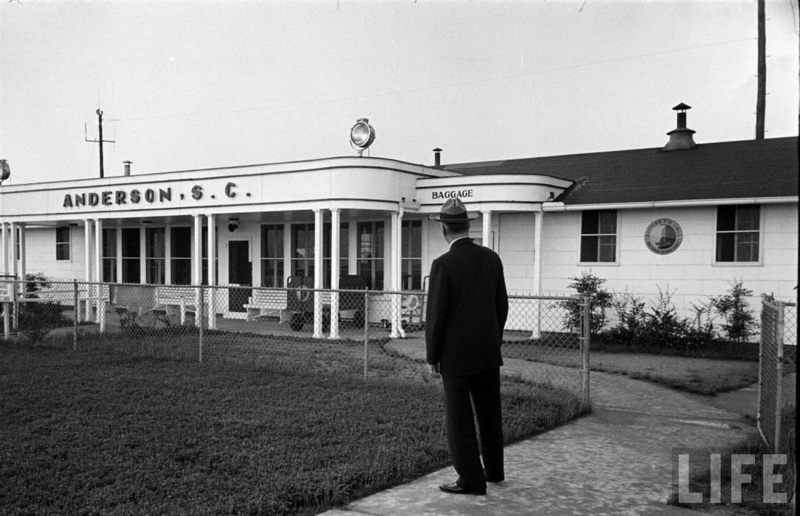 Eddie Rickenbacker looking over the terminal at Anderson, SC. 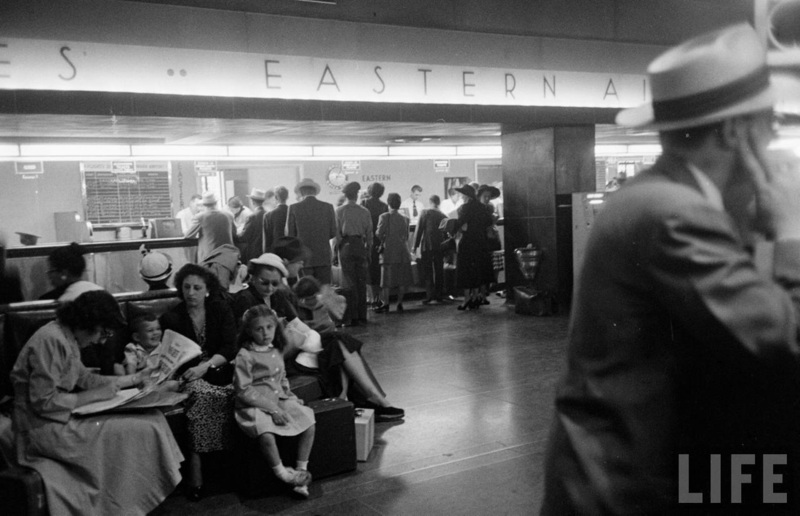 Eastern began service to Anderson in 1947. 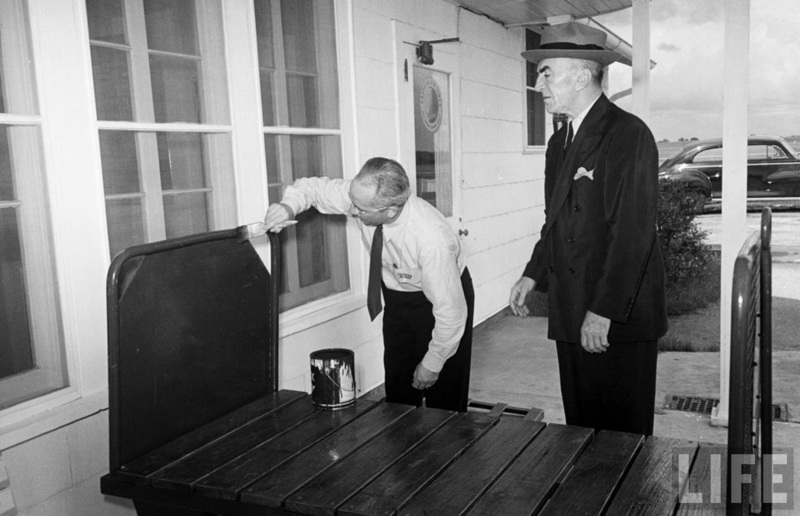 ﻿"Captain Eddie" was concerned with every detail of his airline, even the painting of baggage carts, one of the many tasks expected of a station manager.﻿ This photo was mislabeled as Spartanburg in the final LIFE article. Another regular stop between Atlanta and Charlotte was Greenville, South Carolina. Judging from the clock on the terminal, this was flight 553, scheduled to depart at 1:52pm for the hour-long flight to Atlanta. 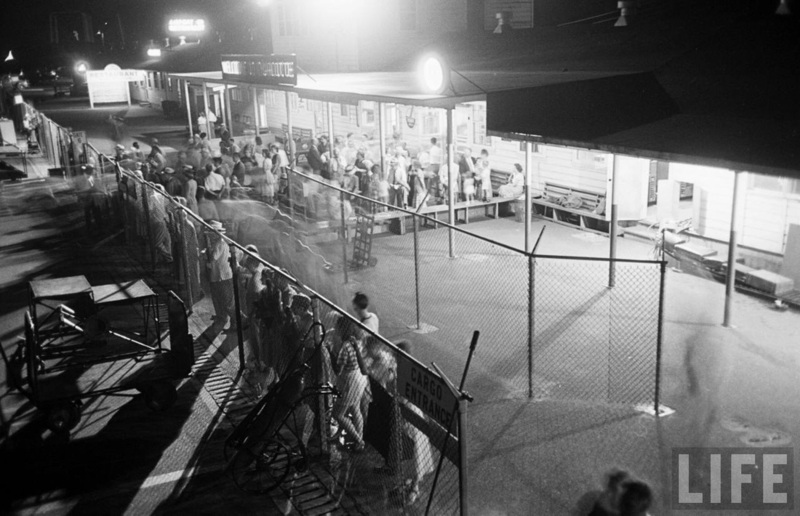 The ticket counter at Greenville, SC. A close look at the arrivals aboard shows flight 553 originated in Boston. The poster at far left says Greenville Miami 4 hrs. 48 min. Another view of the Greenville airport. 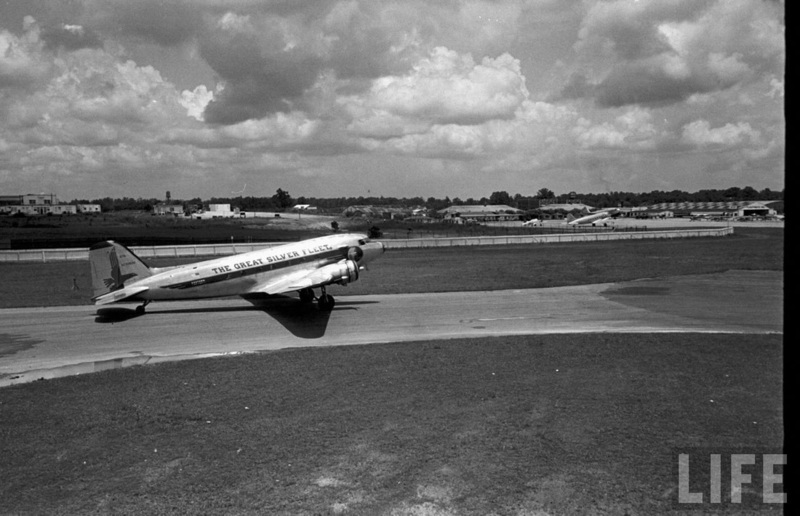 Note the Delta Air Lines DC-3 steps at the edge of the ramp. View from the terminal at Greenville, SC. 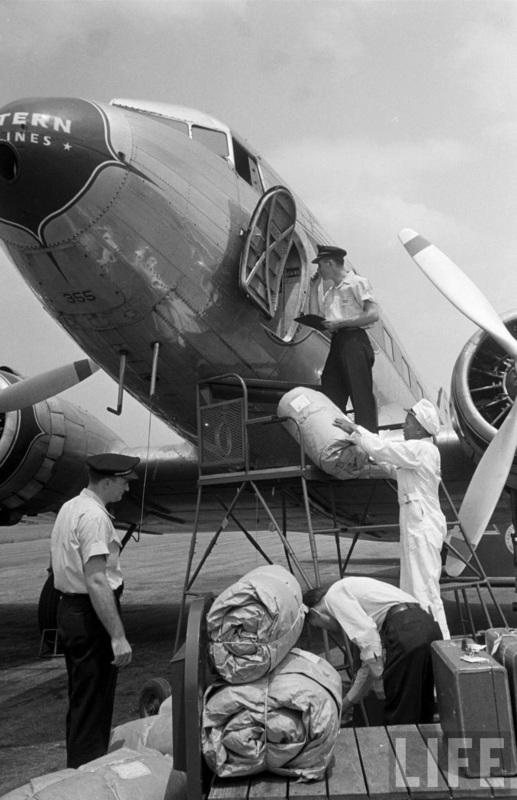 Loading / unloading the DC-3s forward baggage compartment at Greenville, SC. 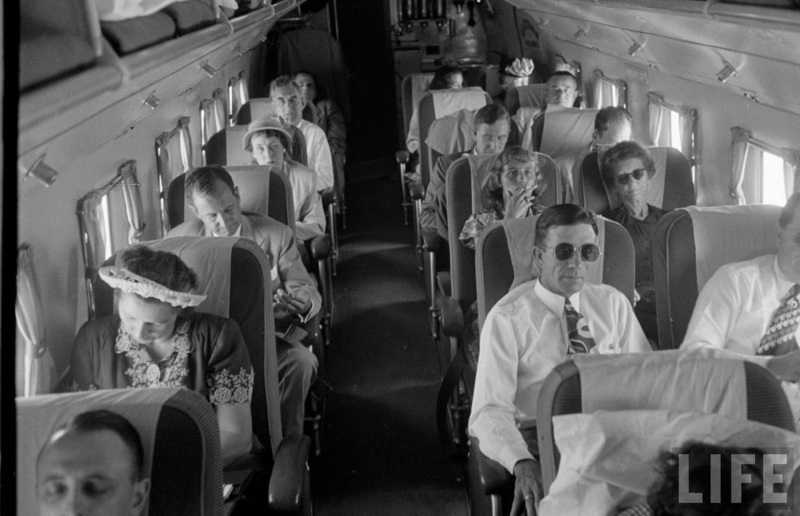 Ship 355 was registered NC25648 (s/n 2236) at served the airline from 1940 to 1953. 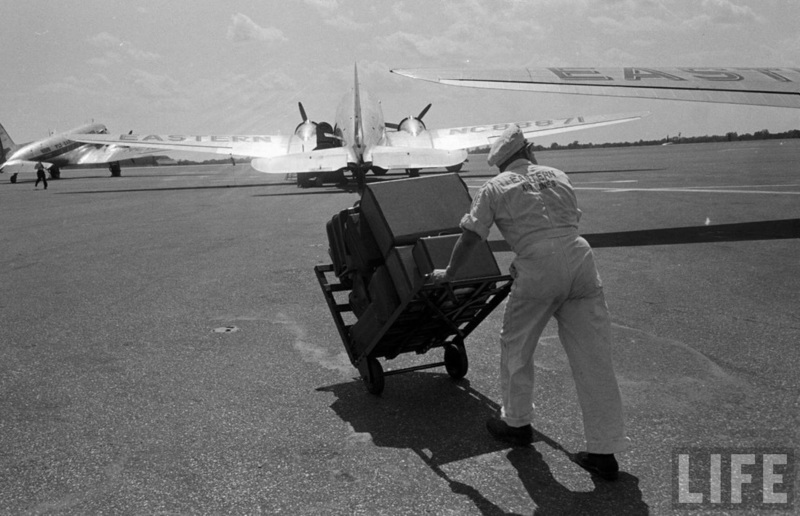 Hauling luggage across the ramp at Charlotte, North Carolina. 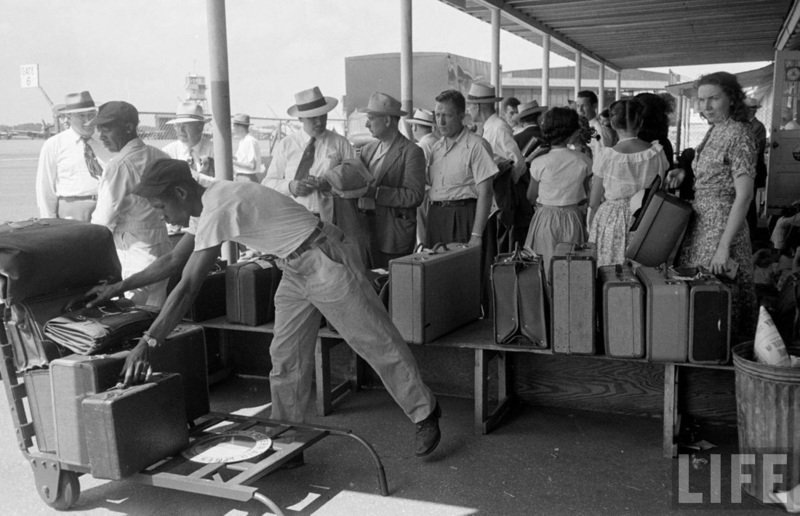 In 1949, the baggage claim area at Charlotte Douglas Airport consisted of a few sheets of plywood between the ramp and terminal building. A busy midday rush at Charlotte. Passengers walked along a fenced-in area between the ramp and terminal to reach the planes. 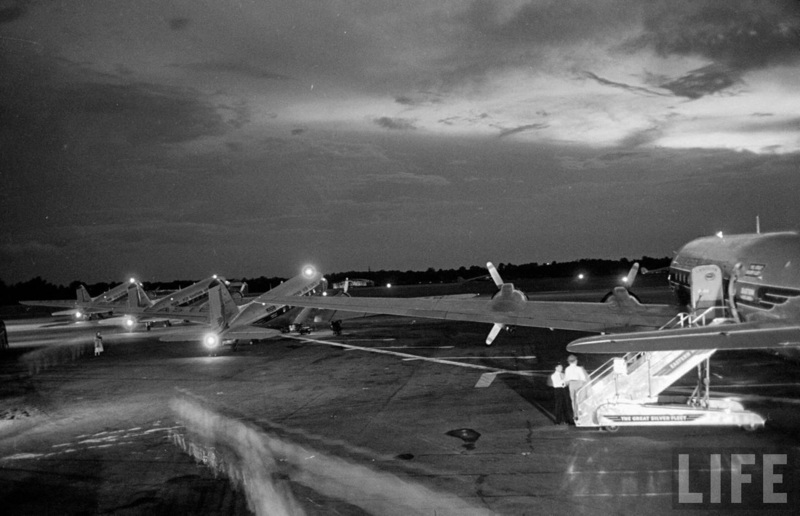 Night view at Charlotte Douglas Airport in June 1949. The aircraft gates were nothing more than gaps in the chain-link fence. A trio of DC-3s and a single DC-4 on the ramp at Charlotte. 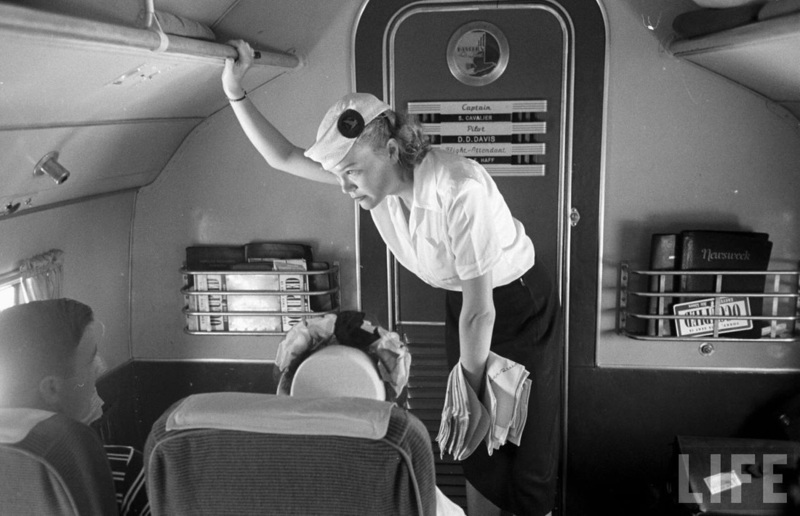 On long flight segments, full meal service was offered on DC-3s. Check out that stylish art deco cockpit door with the names of the crew proudly on display. 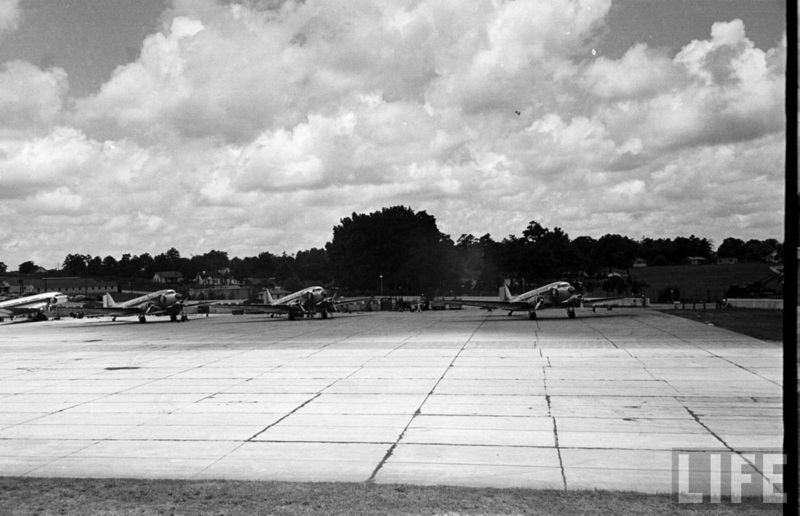 Low flying, unpressurized DC-3s were subjected to significant turbulence in the convective air currents of summertime in the hot and humid south. 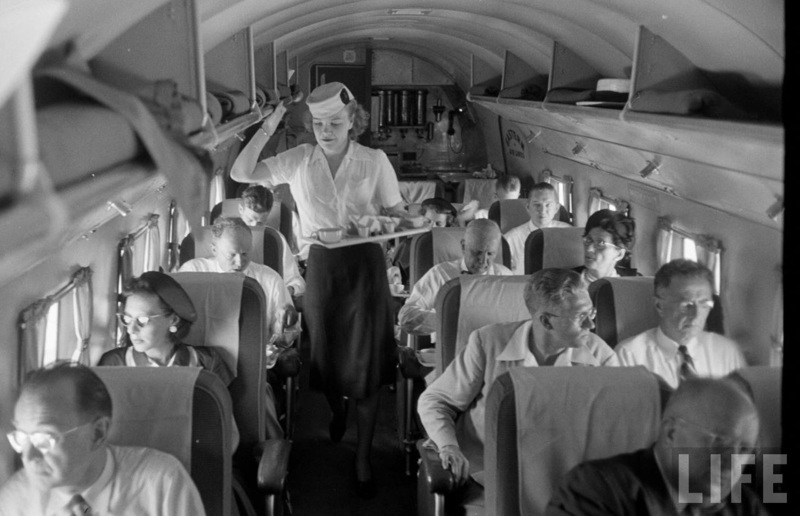 Our flight attendant looks a little woozy as she heads up the aisle. 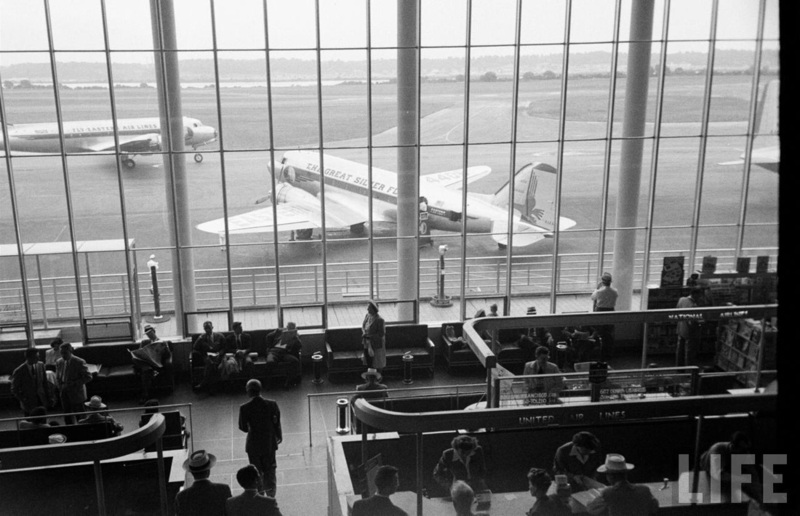 A view from the iconic Terminal A at Washington National Airport. The building still stands although this area is fairly deserted as the ticket counters have been moved to newer sections of the terminal. Click HERE for a modern view of this spot. 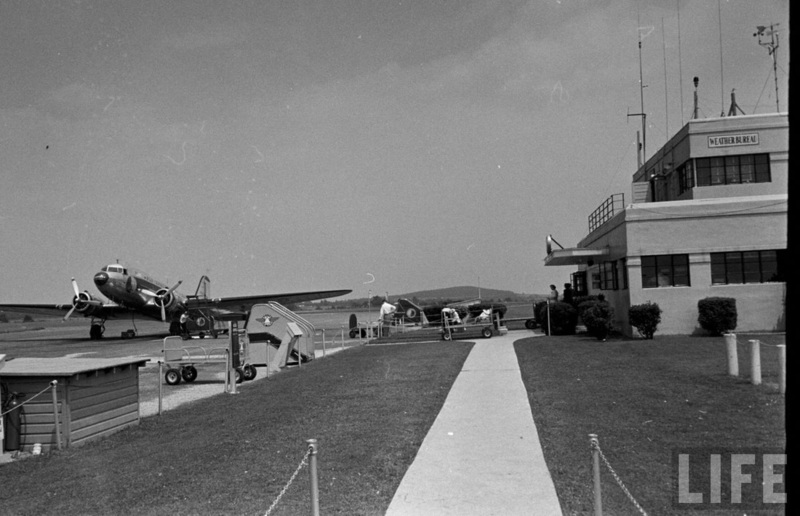 An Eastern DC-3 and Lockheed Constellation on the ramp at Washington National Airport in June 1949. Now boarding flight 570 to Newark! 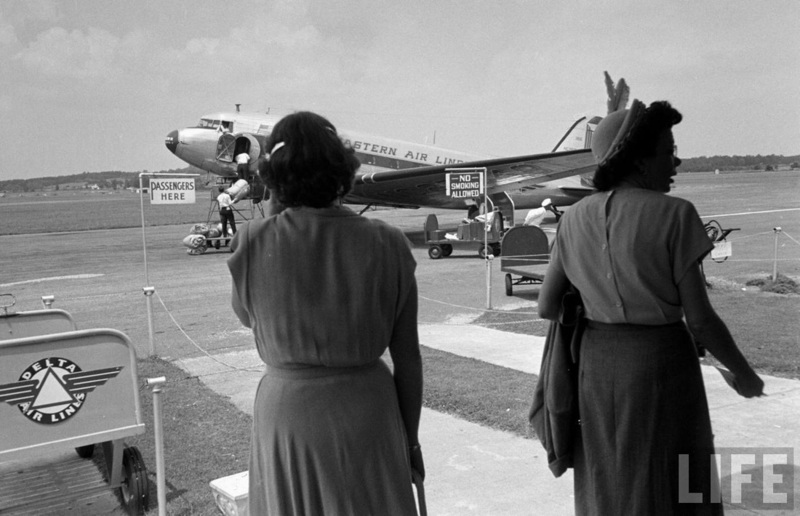 This flight originated in New Orleans with 9 stops on the way to Newark including Atlanta, Greenville, Charlotte and Washington, DC. 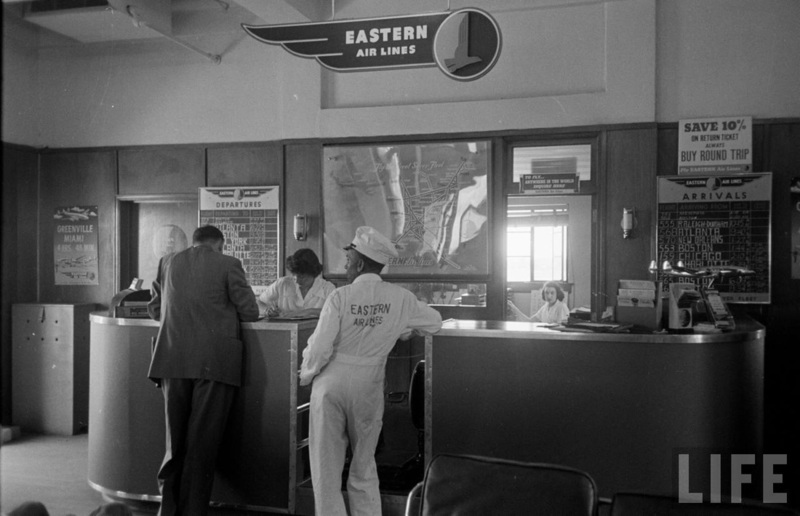 The incredibly modern (for 1949, at least) ticket counter and lobby at Newark, New Jersey. 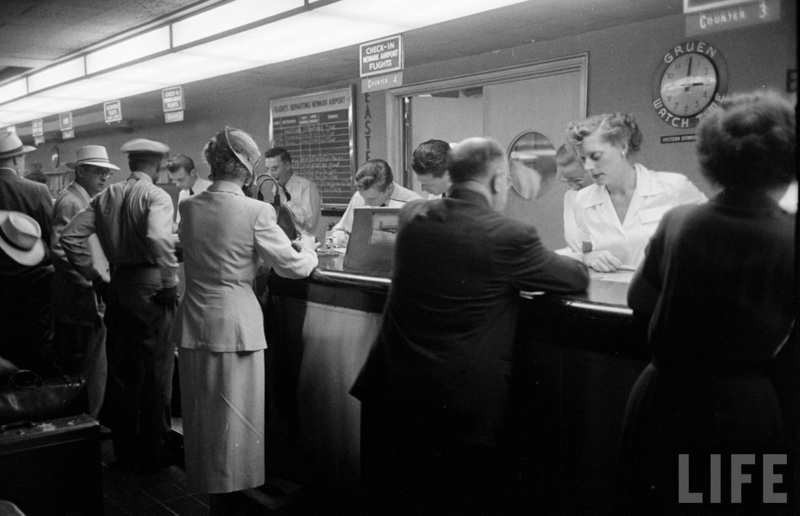 A closer view of the ticket counter at Newark in June 1949. 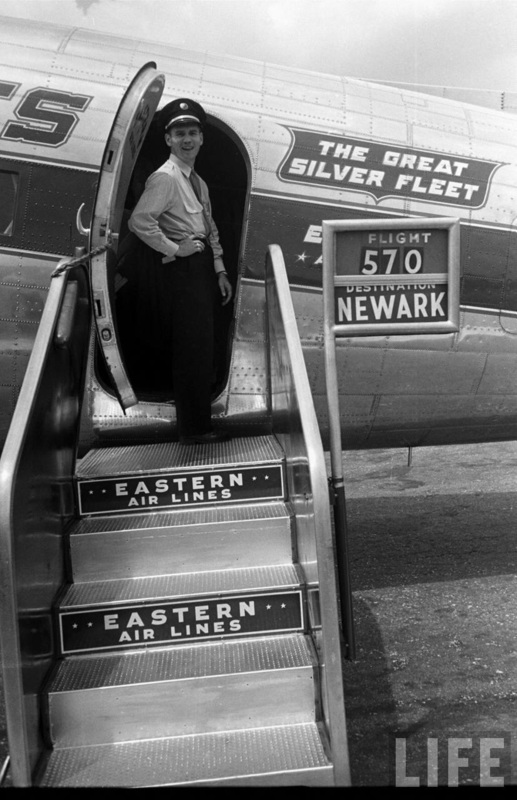 That concludes our look back at Eastern's DC-3s operations in 1949. Coming soon: a similar look back at EAL's classic Constellations.